I am fairly new to the blogging world. I just started this new blog back in the fall, my first. As I do with anything, I had to research what writing a blog was all about, since I was barely familiar with the concept. One of the tips my research brought forth was the suggestion to spend time reading and commenting on other blogs, in order to learn what it’s all about, and later, promote your own blog. So I started searching for other pet blogs. Honestly, I had trouble finding any I really liked that were the type of blog I wanted to write. In my typical impatience, I jumped in with writing first, while continuing to search for other pet blogs. Eventually I began to find some I liked and one led to another. Then I discovered that bloggers don’t really compete with each other as I thought it would be. Rather, they HELP each other and SHARE each other’s work. How wonderful is this? They have “blog hops”, where they directly provide links to each other’s blogs. And anyone can play! It took me a bit, but I figured out how it all worked, and was thrilled when I was able to join in, and other bloggers came over and commented on my posts. When Pamela from Something Wagging This Way Comes put forth the idea of the pet bloggers gift exchange, I was excited to be able to join in the fun. I would either get paired up with a blog I already loved, or get a chance to meet someone new. It turned out to be the latter, and I am thrilled that I was paired with Maggie at Oh My Dog!. I couldn’t wait to start reading and getting to know her work. The first thing I had to do was to see what she had for pets. I was immediately impressed that she had three dogs; two adopted, and one “failed foster”. It seems that when you take in a foster, it is only supposed to be temporary, so when you decide to keep and adopt the dog, that is considered a “failure”. Indeed, Maggie is quite the failure, as Cooper went from fostered to adopted in less than 3 weeks. That is just the first thing I love about her. By the way, how cute are these guys? Lucas – former shelter dog who had a tough first year but with lots of patience made great strides. Cooper – “foster failure” and master escape artist. One of the pages on her site is called “Positively Pit Bull”. It is a collection of stories and photos of pit bulls (& mixes) from across the country. In these days as we are fighting Breed Specific Legislation, pit bulls need all the support they can get. What a great idea, Maggie. Maggie’s posts are a wonderful blend of sound advice (Do You Have a Pet Care Emergency Plan? ), training tips (How to Introduce a New Adopted Dog to Existing Dogs), animal welfare issues (Unexpected Ways to Help Animals Get Adopted), and personal stories (My Date With Emmett) and photos of her own sweet dogs (Let Sleeping Dogs Lie). She also does some giveaways and product reviews. She is a freelance writer and guest blogger on other sites, and also encourages others to guest blog on her site. She recently wrote a book called Positively Dog Training. Oh My Dog! 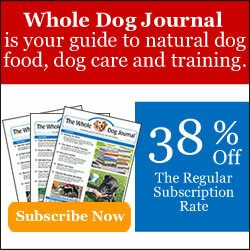 won 2012 Best Dog Blog by Dogtime Media. What impresses me most about Maggie? It looks like she’s been blogging for over three years. About a year ago, she was diagnosed with cancer. Throughout her treatment, she has kept her blog going. Maybe she posted less often, but she also had her husband fill in for her at times, giving updates on her condition, as well as how their dogs were dealing with it all. I just had hand surgery and have barely been keeping up….so I especially admire her strength and perseverance. Maggie, I hope you are almost done with all that, and that your recovery is complete. With that quote, I think she captures the true reason that most of us write our blogs. I encourage you to read Oh My Dog!, see more photos of Maggie’s adorable dogs, and also take a look at and “like” her facebook page. Enjoy! A very neat post! I will go visit, but I just wanted to let you know I really enjoyed your blog! Thank you!! I am going to go take a look at yours also! Hi!!! We just learned about you from Something Wagging This Way Comes and we love your blog! We are now your newest followers! Thank you so much!! I am excited to have a new follower! Oh, I am sorry you missed out, Doreen. We will have to make sure that you know about it next year. Happy Holidays! I have adored Maggie’s blog since before I started blogging myself. She has done amazing things for animals in her community and has definitely made great strides for pit bulls. Thanks for sharing some of my favourite posts of hers! Now I get to go back and read them again. Oh, my goodness. Thank you so much for such a kind, thoughtful post. I’m seriously smiling ear-to-ear! I appreciate all the kind words and the time you put into crafting such a generous post. Thank you, and happy holidays to you and your herd! You are very welcome! Happy Holidays to you and yours also! What a nice post about Maggie and Oh My Dog! I got to meet Maggie at last summer’s BlogPaws conference and I can say she’s as great in person as her blog would lead you to believe. Glad you’ve found the community of Pet Bloggers. You might want to join the annual Pet Blogger Challenge: http://gopetfriendlyblog.com/calling-all-pet-bloggers-mark-your-calendars/. It’s lots of fun and you’ll learn a lot about what others are doing with their blogs and why. So glad you joined the Pet Blogger Gift Exchange! I am so glad I joined also, thank you, Pamela. I will definitely be looking at the Pet Blogger Challenge!